Think On This: Is it worth going bald for 'good hair'? Aprill Turner begged her mother when she was 10 years old for a perm. Turner's mother rejected her pleas, and chemicals didn't touch Turner's hair until she was nearly 15 years old and in high school. Now 32, Turner stopped the relaxers and perms three years ago because they were too damaging to her hair. "If I had to choose one, I would go with weave and braids over not putting chemicals in my hair," said Turner. "Chemicals are much more damaging to my hair than braids." But now braids and weaves are causing a new concern for many black women -- they are causing hair loss. Dr. Angela Kyei, chief resident at the Institute of Dermatology and Plastic Surgery at the Cleveland Clinic, conducted a study with over 300 African-American women in Cleveland. Her results found that the women who had the worst kind of hair loss or central centrifugal cicatricial alopecia (CCCA) wore braids and weaves more than others. Because braids pull on the hair follicle, if they are too tight they cause so much stress that the hair comes out. If it continuously happens, it can leave a scar so severe that hair can never grow again in that spot. "People come to me with CCCA, and it's so advanced that there is nothing we can do for them," said Dr. Kyei. "It is very frustrating as a physician, I can relate to them and what is happening, but I can't do a lot to get their hair back." 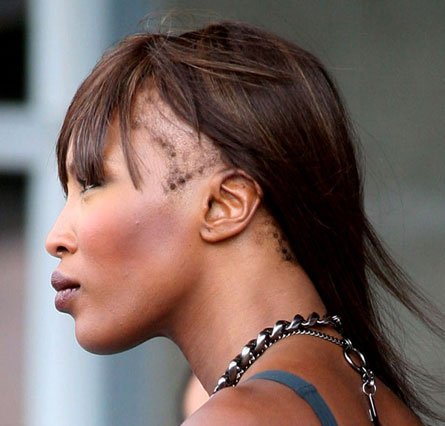 Hair loss among black women has been as serious problem for decades. In the 1960s, when hot combs were commonplace, black women's hair took a beating. While there aren't many studies that have been conducted with African-American women, Dr. Kyei's study shines a spotlight on a booming industry. Hair loss may not just be cosmetic either, but also medical. Women who had type two diabetes had the most significant hair loss in the study. "It is common knowledge that African-Americans are affected disproportionately by type two diabetes," said Dr. Kyei. "Bacterial scalp infections are also associated with the worst type of central hair loss. Most people consider hair loss a cosmetic thing, but we're finding there may be a systemic disorder associated with it." Nantale Nsibirwa, 21, is a senior at Columbia University and after years of getting perms for maintenance purposes while she played sports in high school, she was forced to wear it natural after a bad relaxer with a new stylist. "My hair got to a point where it wasn't even taking a perm anymore," said Nsibirwa. "So I got a weave, and then braids to transition into wearing my hair natural. I never really kept them in past six weeks. But, if I did wear them too long, my edges would show less hair in some places because the braids were too tight and it just pulled on the root too much." Nsibirwa joins the majority of black women who use relaxers. Dr. Kyei notes that over 90 percent of African-American women get chemicals relaxers. The study did not find any relationship between chemical relaxers and hair loss, but it does not mean that perms are necessarily healthy for black hair. "Although there was no relationship between relaxers and hair loss, the scalp is a sponge," said Dr. Kyei. "Over time it is not unusual for the scalp to absorb and cause some type of damage. Parents should not be putting relaxers in their 1 year old's hair, that's probably too early." It can be complicated for black women. There are various reasons why women avoid wearing their natural hair, ranging from concerns about looking professional, to making personal aesthetic decisions. "Braids are easier to tame, having an Afro you have to comb it out and make sure its not knotted at all," said Nsibirwa. "With braids, you can pull them up in a ponytail, wake up and go on with your life. It severely reduces the amount of time you have to spend on doing your hair." But for women who enjoy the conveniences of weaves and braids, they can still have them. Recommendations aren't to stop wearing them, but rather to just use common sense when it comes to hair care.